I read this article and found it very interesting, thought it might be something for you. The article is called How A Make-Work Programme Changed The Lives Of Women In Kerala and is located at https://archive.indiaspend.com/cover-story/how-a-make-work-programme-changed-the-lives-of-women-in-kerala-93580. K.B.Vasanthi, 48, is a block panchayat member in Thalikulam block, Thrissur. She has been working under MGNREGS since 2008, and says if it weren’t for these wages, she would not have thought of contesting elections. Thrissur: “I’m extremely sorry for being late. We had a long meeting today,” said K.B. 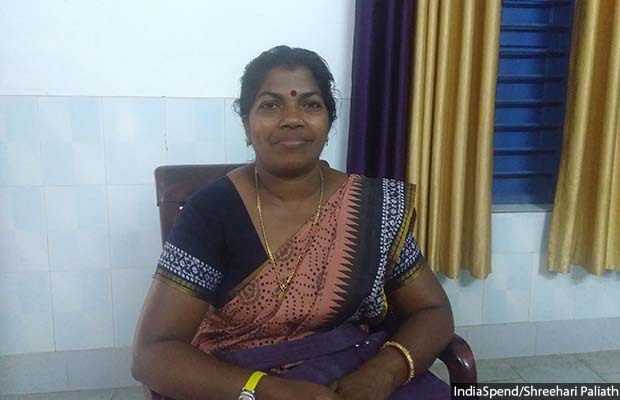 Vasanthi, a 48-year-old ward member of Thalikulam block panchayat in Kerala’s Thrissur district, who is also a registered worker under the Mahatma Gandhi National Rural Employment Guarantee Scheme (MGNREGS). Vasanthi has continued to work under MGNREGS despite being an elected local-government representative, although not as much as before. “My husband has health issues and the money he earns from fishing hasn’t been great for a while. We had loans to pay and three children to take care of. MGNREGS work has been of great help,” she said. Such high participation of women in manual labour was not always the norm in Kerala. In 2005, just 15.9% of the state’s women worked for a living, when the national average was around 30.7%. The role of Kudumbashree, Kerala’s poverty eradication and women’s empowerment mission, has been significant in mobilising women for the unskilled labour opportunities that MGNREGS offers, and ultimately changing old attitudes. The complementarity between Kudumbashree’s self-help groups and the jobs programme has spawned economic and social opportunities that women have been quick to grasp. Kudumbashree creates ward- and panchayat-level citizens’ groups that work in tandem with local self-governments to reduce poverty and improve governance. “When the number of workers at one site is less than 50, the supervisors are considered as workers and given daily wages for unskilled workers. 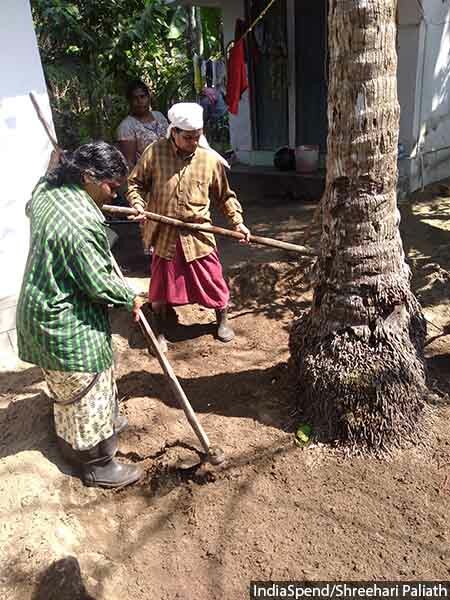 But when there are more than 50 workers, the supervisors are considered as semi-skilled workers and given wages of semi-skilled workers,” Vinodhini N., joint programme coordinator for MGNREGS in Thrissur district, said. Over the years, as more women have registered and shared their experiences, and the government’s mobilisation and awareness campaigns have begun to have an impact, the numbers have increased, MGNREGS worker Kuttan said. Many women workers get offered casual work by other employers due to their MGNREGS experience. Kuttan said she saved money for her daughter’s wedding and bought jewellery from her MGNREGS savings. There has been a four-percentage-point decrease in women’s participation in 2016-17, which an official–speaking on condition of anonymity–said was because more “scientific” methods were being used to assess workers’ performance, which may have discouraged the elderly and some other workers from taking up MGNREGS work. Often, workers deposit Rs 30-50 a week into the thrift fund set up by their local Kudumbashree unit. The small regular savings of neighborhood groups are pooled and given out as internal loans to the most deserving in the group, according to the Kudumbashree website. These loans are useful if members face immediate financial shocks. Members’ MGNREGS wages have enlarged this pool. MGNREGS work has also strengthened bonds between workers, enabling elderly women to work, too. “The employment programme gives me a source of income. Who else will employ me at my age?” said 65-year-old Devaki, one such beneficiary in Thalikulam village, who only shared her first name.